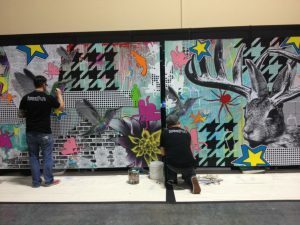 "LIVE" 6.5′ x 19′ Three Day Mural by *KREASHUN* at S.L.A.T.E. in Las Vegas during MAGIC! 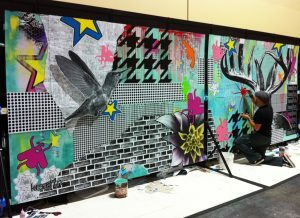 *POP* in and check the “LIVE” 3 day mural done by KREASHUN at S.L.A.T.E. 2012 in Las Vegas. Thanks to the MAGIC/SLATE crew for having us!